For hours Tuesday, John Flickner sat in his wheelchair in a Niagara Falls apartment building lobby – clutching his medical marijuana and worried about where he would go for the night. John Flickner, 78, waits for word on where he can go after being evicted from his Niagara Towers apartment for his use of medical marijuana. The prescribed drug eases his chronic pain from a skydiving accident 50 years ago. 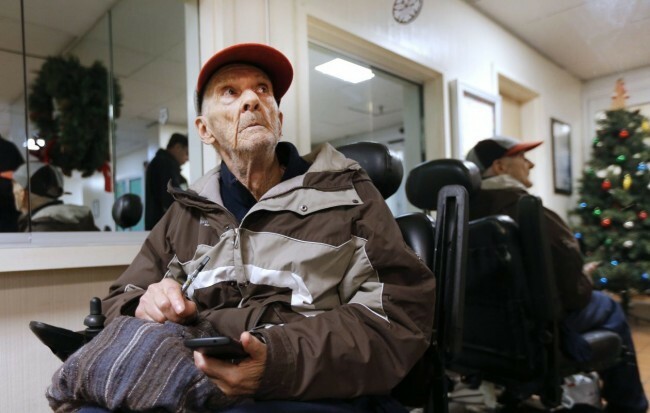 It also got the 78-year-old man evicted from Niagara Towers, sparking a debate about a tenant's rights to medical marijuana in a federally subsidized facility. Flickner uses the drug with a doctor's prescription, and he has carried a New York medical marijuana card since a run-in with managers last summer at the senior low-income housing facility subsidized by the federal Department of Housing and Urban Development. "It's a vaporizer," Flickner said of his prescription. "It's got a battery and a cartridge fits on it. The oil's in it. You don't smoke it. There's no odor to it." The vapor relaxes the muscle spasms that make it hard for him to breathe, he said. "Just a minute or two after using it, it starts to take effect," Flickner said. But while state law allows Flickner to use prescribed medical marijuana, federal law allowed his landlord to evict him for drug possession. As the use of medical marijuana spreads in New York State, more people could find themselves in the same position as Flickner: Use the prescribed drug and risk eviction from a HUD apartment, or steer clear of medical marijuana and stay in the apartment, but live with pain or take potentially addictive pills to kill pain. Federal law did not require Niagara Towers to evict Flickner. Indeed, the law gives HUD building managers the flexibility to allow residents to take the prescribed drug. But the company that owns the 201-unit high-rise on Cedar Avenue was not willing to let Flickner do so. "We don't allow marijuana of any kind – liquid, smoking, whatever," said Amy Styles, a spokeswoman for LHP Capital, the Tennessee company that operates the Niagara Falls facility and 56 others around the nation, including Tonawanda Towers and Urban Park Towers in Lockport. Doctor's prescription or not, LHP enforced its policy on Flickner, persuading a Niagara Falls judge to sign an eviction order because of Flickner's marijuana possession.